After technologically superior aliens conquer earth, humanity survives very much like mice, living within the walls of the huge homes of the giant aliens. They scurry about under their feet, stealing food and avoiding the ever more devious traps set out for them. As time goes on humanity adapts and a complex social and religious order evolves where the women of each group preserve the knowledge while the men become warriors and thieves. For the conquering aliens the humans are little more than pests, which could actually be their greatest strength. Of Men and Monsters is essentially a parody of the classic novella "Of Mice and Men" by John Steinbeck, replacing the mice with men - reducing their status to that of vermin and then replacing the role of men with monsters. The protagonist of the story is Eric the Only, named due to the fact that he was a single born rather than as a litter. Eric is a member of Humanity - population 128 and we join him just prior to his coming of age test, a test that will determine the status within humanity and will seriously affect his future within the tribe. It is here that we first learn of the religious and social nature of the surviving human race (or at least one tribes ideas of such). The whole idea presented here is fantastic - a time when humans are no longer the dominant species and exist as parasites - surviving off the small amounts of food and technology that they can steal from the massive, really alien aliens. It's good to see that even as an inferior species that the human race could survive and the idea that different sub-species of humans could eke out an existence in each alien house - cut off from other groups and evolving in their own way was for me a great idea. I also loved the satirical, tongue in cheek approach that the author uses to great effect here, re-enforced by a very uncomplicated and uncluttered narrative that never once becomes lost in technobabble or lapses into world building or excessive exposition. The simplistic nature of the prose does at times make the novel feel very much like a young adult story - a feeling that is re-enforced with the occasional unsubtle solution to some of the problems Eric faces and the action orientated approach to many situations. It is however this simple style that also helps to highlight the ideas presented here - the dangers of fundamentalist, organised religion and the arrogance that humanity thinks it is the centre of the whole universe being the main points. I also think it's important to also remember that this novel was originally published in 1968, before there was very much equality and this is at least in part addressed at a few points in the novel. 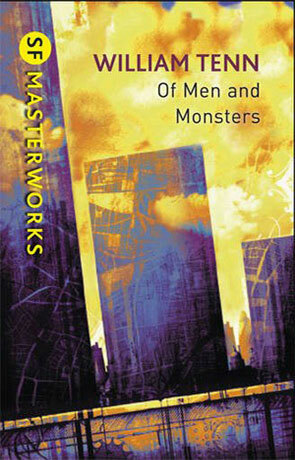 Of Men and Monsters is a classic, it's got style, class and some really great ideas, well worth checking out. Written on 7th September 2011 by Ant.